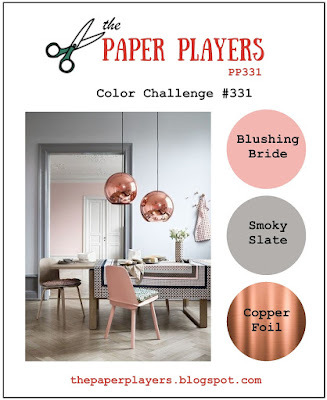 On Wednesday, I told you that I had another entry for The Paper Players Colour Challenge this week, and that I would post it on Friday. 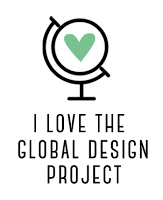 Well, it's Friday and here I am, with a more fun-loving design than my delicate copper embossed flower from Wednesday. 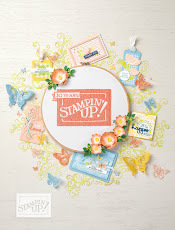 But I love this colour palette so much that I couldn't resist making two cards for it. Don't you agree? So elegant and warm. This next design uses more actual Copper Foil Sheets than the last design. It also uses the Lift Me Up stamp set to take you into the heavens for some hot air balloon fun! 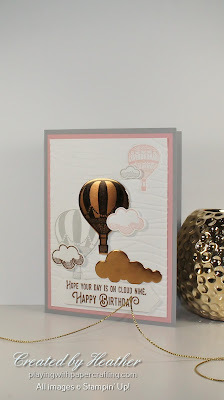 You can see that one of the balloons and one of the clouds is stamped in Smoky Slate and one balloon and one cloud is stamped in Blushing Bride ink. The copper comes in with a large copper cloud die cut using the Up and Away Thinlit Dies (which are bundled with the Lift Me Up stamp set), a copper foil hot air balloon, which was stamped with StazOn ink, dried and die cut with the same thinlits, and a cloud heat embossed with Copper Stampin' Emboss Powder. and die cut. The Whisper White background was debossed with the Seaside Embossing Folder. 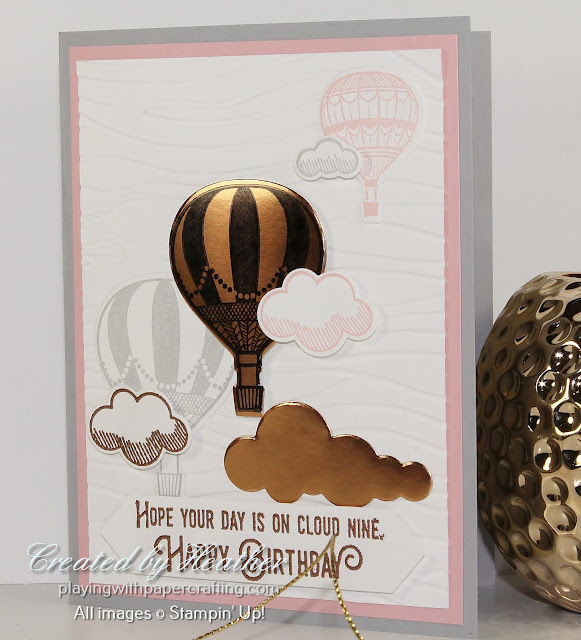 Using the debossed side gave a lot more surface area to attach the balloons and clouds onto. 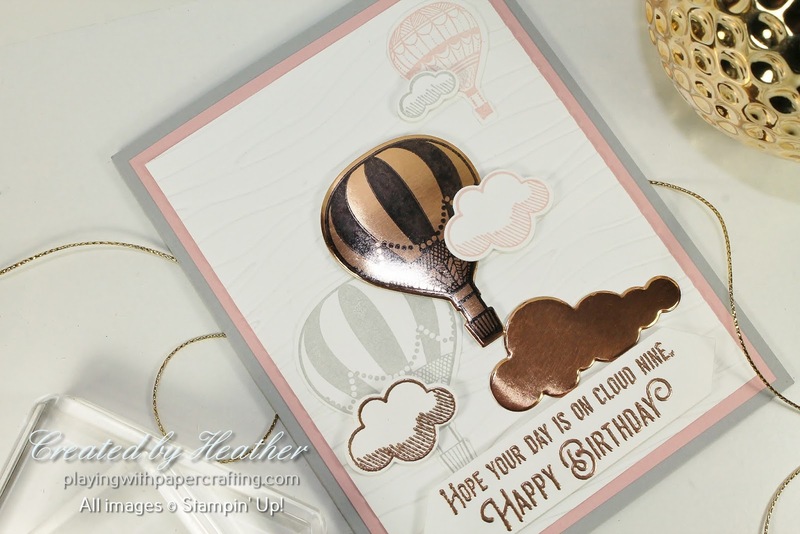 The sentiment, also from Lift Me Up, is embossed in Copper Embossing Powder and die cut using the Project Life Cards and Labels Framelits. 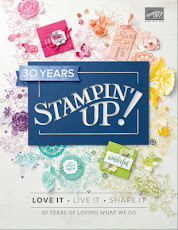 It is mounted with Stampin' Dimensionals. 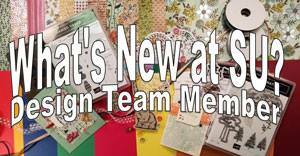 I'm helping to lead a weekend crafting retreat this Saturday and Sunday to a most unusual venue. It's a famous ice cream store in our valley, but it's closed for business in February. The owners are letting us have our retreat inside this funky little store. We are creating and eating some meals there, but going home to our own beds at night (except for me - I'm too far away), which is nice. 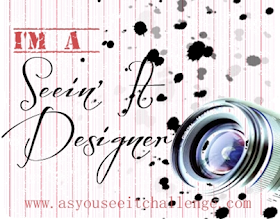 I'm hoping I get lots of creating done this weekend to share with you on Monday! Have a great weekend yourself!